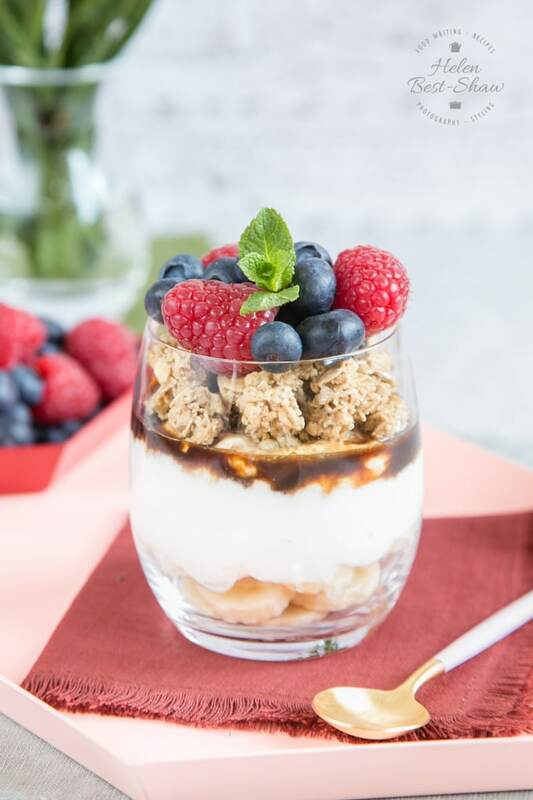 A quick and easy layered breakfast parfait based on the flavours of a banoffee pie. Perfect for children to make. I’m not quite sure if these cheat’s healthy banoffee pots pots should count as a breakfast or a dessert. Probably both – I’d happily eat two a day! They are so easy to make; simply later up sliced banana, creamy thick Greek yogurt, and dark brown soft sugar and leave in the fridge for a few hours. Just before serving, top with granola and some berries. These no cook layered banoffee parfaits can easily be made by small children – ideal for a Mothering Sunday breakfast in bed. Making toffee yogurt by sprinkling dark brown soft sugar over natural or Greek yogurt and leaving it to dissolve is an old, but useful trick. The sugar slowly dissolves into the yogurt making a delicious toffee flavoured banoffee layer. And using yogurt is so much healthier than canned caramel sauce, that’s mostly made out of sugar. Serving food layered into a glass is such a fuss free way to make the simplest of dishes look instantly elegant and even dinner party worthy. These would be perfect served alongside a mid week supper with friends. Assemble as soon as you are home and leave in the fridge whilst you enjoy the rest of your meal. If you try this Cheat’s Healthy Banoffee Pie Pot please tag #FussFreeFlavours on Instagram or Twitter. It is amazing for me when for me when you make one of my recipes and I really do love to see them. You can also share it on my Facebook page. Please pin this recipe to Pinterest too! Thanks for reading Fuss Free Flavours! 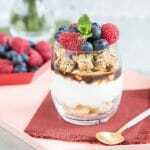 A quick and easy layered breakfast or dessert parfait based on the flavours of a banoffee pie. Perfect for children to make. Slice the banana and place in a glass, cover with the yogurt, then sprinkle the sugar over and leave in the fridge overnight. Just before serving sprinkle over the granola and the fresh berries. Make it vegan with a non diary yogurt.